Luigi Barbasetti was born in Cividale, Italy on February 21, 1859. His fencing master was Maestro Giuseppe Radaelli a follower of the Northern Italian School, under whose tutelage Barbasetti was trained to be a military master of arms. 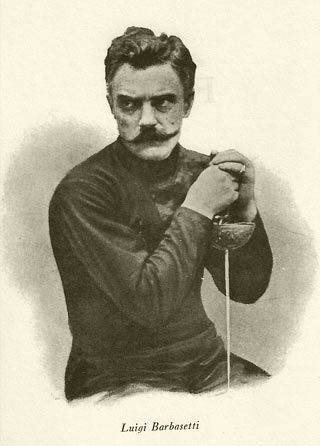 In the late 19th century, during the attempted restructuring of fencing in Italy Barbasetti was ordered to go to Rome to be re-trained in the southern method of Maestro Masaniello Parise through courses at the Military Fencing Masters School in Rome. Upon completing his courses Barbasetti remained for a time as part of the faculty. Upon leaving the Military Masters School, he returned to Radaelli’s methods and continued to teach the system of his original master for the rest of his life. Babasetti taught in Trieste and afterward in Vienna and at Wiener Neustadt from 1894 through 1914. Due to the outbreak of World War I he left Austria and returned to Italy where he remained until he moved to Paris in 1921. During his time in Paris he taught fencing at the Automobile Club and the Golfers Club. Masetro Barbasetti returned to Italy in 1943 where he lived in Verona until his death on March 31, 1948. Achieving worldwide recognition as one of the finest masters of sabre fencing, he brought international fame and recognition to the Radaellian School via his long career in teaching the art and science.